Thanks for stopping by. I am a Christian apologist, husband to the most beautiful, smartest, and most attractive woman on the Earth, father to two loving children, big-system UNIX system administrator, and aspiring writer and commentator. I hope to use this forum to expand upon my interpretations of the Restoration Movement, Christian apologetics, the Biblical description of the End of the Age, surplus computer auctions, and just about anything else that happens to rattle through my mind. Please have patience with me as I get the design work finished up. Since you've put up with me not saying much, I'll explain why "Kentucky Packrat" after the break. Packrat: Any of several bushy-tailed rodents of the genus Neotoma of western North America; hoards food and other objects. In Southern parliance, "Packrat" is a person who collects and hoards junk for possible later use. When I first went to college, there was a pre-Internet chat program called "Phone" on the Prime miniframe which required nicknames to register. Since I already had the habit of collecting junk, Packrat seemed a logical name. While I did show up on IRC in the 1991-1992 era as "Yorick", I stayed visible until I graduated as "Packrat". After getting a real job in 1996 that didn't have Internet access, "Packrat" kinda faded out. 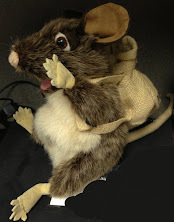 When I started getting involved online again, I found that there were just too many "Packrat"s to make me unique, and my ego wants me to be unique. :) Since I am a Kentucky Packrat, I decided to choose "KYPackrat" as my new nickname, and the rest (as they say) is history.